Meow! has just received a giant collection of over 100 vintage scarves. Adding to our already extensive selection, this new lot contains a scarf for everyone. 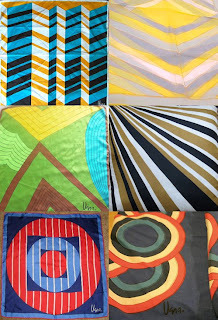 Everything from vintage silk and rayon scarves from the 50s-60s-70s, to more recent productions, and representing designers and manufacturers from Europe, Japan, Canada and the U.S. We always have a selection of vintage designer scarves from the likes of Vera, ECHO, and others. Rge scarf is the perfect Summer accessory: use it as a belt, skirt, halter top, or tie. Use it on the wrist, in the hair, or to jazz up a bag. Most scarves are only $4 each or 3 for $10.